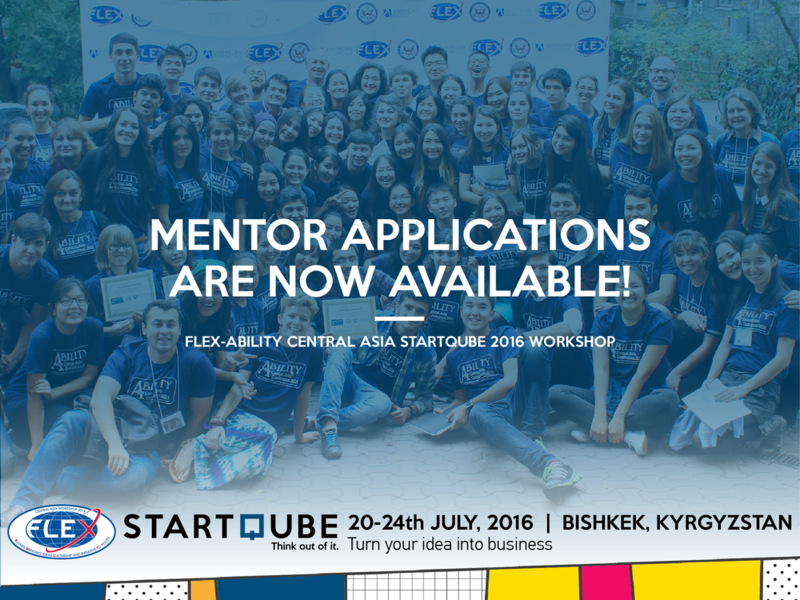 American Councils for International Education announces the Central Asia FLEX-Ability StartQube Workshop to be held in Bishkek, Kyrgyzstan on July 20-24, 2016. The workshop is designed to teach FLEX alumni from Kazakhstan, Kyrgyzstan, Tajikistan and Turkmenistan about Social Entrepreneurship. The program includes multiple workshops that cover the A-Z regarding developing an idea into a working business, conducting market analysis and marketing strategies with social impact, access to investment, etc. The program has a strong focus on practical knowledge sharing from mentors to participants. Mentor requirements:The FLEX Alumni program is seeking local experts from Central Asia who will share best practices, knowledge, and professional expertise with participants. Mentors will be selected by a panel of evaluators of StartUp Zone, U.S. Embassy, American Councils, and FLEX Alumni program staff based on the submitted application and the professional experience and background. It is expected from mentors to be present on-site for the whole duration of the training. Mentors will be assigned to a few workshops relevant to their field of expertise, and during the rest of the time, they will be closely working with a few assigned teams of participants. Selected mentors are expected to arrive in Bishkek for Training of Mentors two days prior to the official beginning of the program, July 18-19. During this training (mandatory for all selected mentors), you will be introduced with the training structure, workshop plans, and all other details necessary for your mentor role. Application Information: Interested applicants must complete and submit the online application with all accompanying materials and a picture for the conference handbook on June 10th, 2015 11:59 PM EST. Late submissions will not be accepted! Trainers who are chosen for this program will receive round-trip transportation to Bishkek, Kyrgyzstan, housing for the Training of Mentors and the workshop, all meals, and insurance if needed. Additionally, every selected mentor will receive a symbolic engagement fee $300 for their role at the workshop.